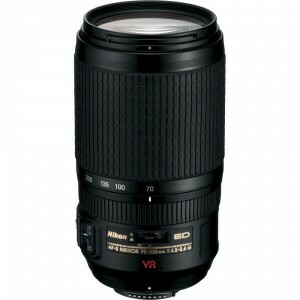 The Nikon AF-S 70-300mm f/4.5-5.6G IF-ED is a telephoto zoom lens designed for Nikon Full Frame (FX) digital SLR cameras and can be used on Nikon APS-C (DX) bodies as well. When used on a DX body the lens provides the same field of view as a 105-450mm lens on an FX body. This additional reach is beneficial for wildlife photographers who need longer telephoto lenses but don’t want the bulk that comes with a longer focal length lens. Overall, Image quality is pretty good from the Nikon AF-S 70-300mm f/4.5-5.6G IF-ED lens up to about 200mm. from 200-300mm the lens does get a little bit softer, but for the price point the performance is not bad. All lenses are a compromise and have a weakness. For the Nikon AF-S 70-300mm f/4.5-5.6G IF-ED the chromatic aberration is it’s Achilles Heel. However, CA is very easy to fix in post processing, especially if you shoot in RAW and use a program such as Adobe Lightroom, which has lens profiles for this lens and handles the CA correction very well. Build quality is decent, although the lens is made of mostly plastic. However it does have a metal mount and a rubber gasket where it mounts to the camera body to help keep dust incursion into the body to a minimum. Officially the lens is not weather sealed, so be sure not to take it out in heavy rain, snow or where it might otherwise get wet. This is one of the best consumer 70-300mm lenses available today. The only 70-300mm lens that I have ever used that was better was the Canon EF 70-300mm f/4-5.6L IS USM. To be fair, the Canon costs over 3x more than the Nikon AF-S 70-300mm f/4.5-5.6G IF-ED, but I certainly don’t see three times better performance. At under $500 this lens is a great value, and even if you shoot with an APS-C body I heartily recommend this lens over the 55-300 DX lens. The Tamron 70-300mm VC lens comes close to matching the performance of the Nikon lens, and at $50 less might be a viable option (especially when Tamron offers their mail-in rebates that take the final cost down even further) for those on a tight budget. I personally prefer to use genuine brand lenses unless there is a tremendous cost savings and for me the extra $50 is worth it to have the Nikon brand on the lens. based on 2645 user reviews online.